To perform all functions related to the management of users in the system. Step 1: Click on -> Select -> Select in toolbar. Step 2: Fill the necessary details in the below “Create a User Account” screen. There are five different user types’ displays under “User Type” drop-down list. These user types provide users different types of permission in the application. This type includes all permission given for the “Viewer” user type and below mentioned permissions. This type includes all permission given for the “User” user type and below mentioned permissions. This type includes all permission given for the “Manager” user type and below mentioned permissions. Step 3: Click on button. This will send an email to added user to confirm the registration. Step 2: From the dropdown menu, select button. 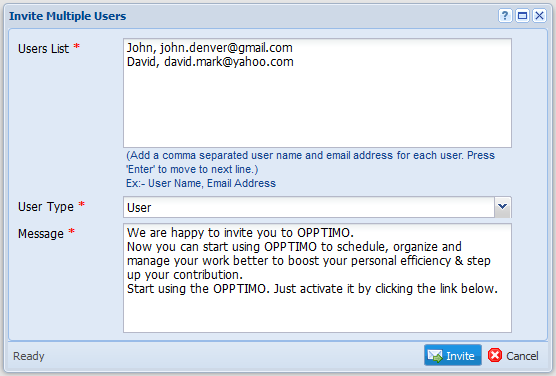 Step 3: Fill the necessary details in the below “Invite User” screen. Step 4: Click on button. This will send an invitation email to invited user to register with the system. This option provides a user to invite a group of people with a one permission level. Step 3: Fill the necessary details in the below “Invite Multiple Users” screen. You can go to panel and follow the above same steps to invite multiple users as well. Step 1: Click on -> Select -> Select -> Click on icon of the user you wish to re-invite. Step 2: Click on “Yes” button to confirm the re-invitation on pop-up box. This will send a re-invitation email to the user to register with the application. Step 1: Click on -> Select -> Select -> Click on icon in the invited user window. Step 2: Click on “Yes” button to delete the invitation on pop-up box. Step 1: Click on -> Select -> Select icon in the user window that you wish to edit. Step 2: Update the user details in the below “Edit User” window. Step 3: Click on button. Step 1: Click on -> Select -> Select icon in the user window that you wish to delete. Step 2: Click on “Yes” button in confirm pop-up box. This will block the user and avoid access to the application, but do not delete the user permanently. If you need to view deleted users, use option. Logged-in user cannot delete own user account. Therefore, option is disabled in front of logged in user name. Step 1: Click on -> Select -> Select icon in the user window. Step 2: Select the team you wish to assign the user from below “Assign to Teams” window. Step 3: Click on button to save the record to the system. “Assign to Teams” window provide the facility to create teams / edit teams & delete teams as well. By managing user template fields, users can include specific field templates matching to each and every user. This option is available only for “Admin” type users of the system. Step 1: Click on -> Select -> Click on edit users button. Step 2: Click on In “Edit Users” window. Step 3: Select a “Field Template” and click button. 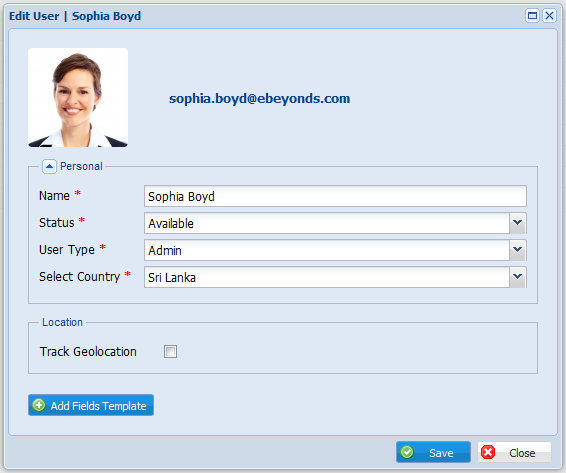 Refer Fields Templates section in the Help Guide for step by step guide to create custom field templates. Step 2: Click on option in toolbar. This will show the all users in the system including deleted users. 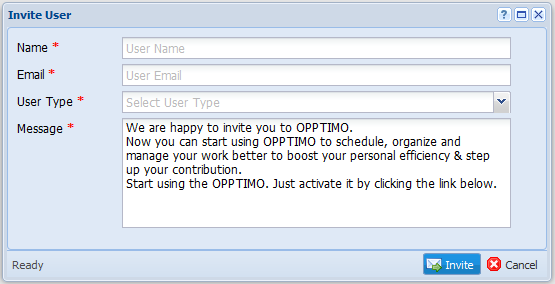 With permission levels and requirements, OPPTIMO user detail views can be restricted. There are three main permission level. 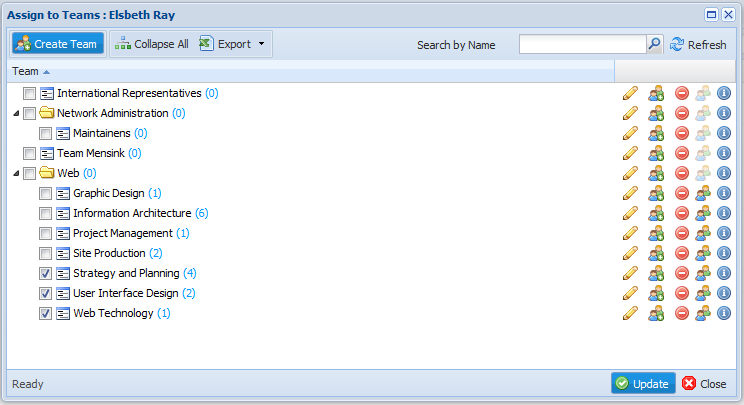 Default View – Users can view other user details, currently working jobs etc. User Detail Restricted to Team – Users only can view details of their team members what they are currently working on etc. User Detail Restricted only for the User – Users only can view their own details. Copyright © 2019 OPPTIMO. All Rights Reserved.